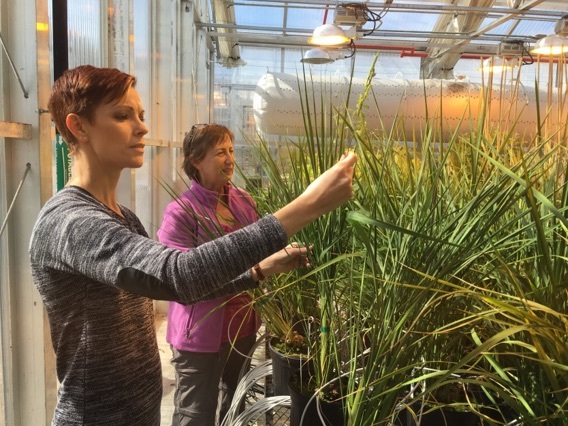 Oak Ridge National Laboratory researchers Sara Jawdy (left) and Lee Gunter evaluate the growth of rice plants carrying a genetic mechanism that reduces lignin and increases flavonoids. December 7, 2016 – Livestock may soon be getting more nutrition from forage feed thanks to an invention from the BioEnergy Science Center at Oak Ridge National Laboratory and partners at the University of Tennessee and West Virginia University. Working with a population of poplar trees, the scientists identified a gene that regulates the production of lignin, the material that lends plants rigidity. By altering lignin synthesis, the gene can decrease lignin content and increase desirable flavonoids, resulting in plants that are easier to digest and more nutritious. Preliminary studies showed that the genetic mechanism has the same effect in Medicago truncatula, a model system for alfalfa, which is widely used for animal feed. “We’ve achieved decreases in lignin of up to 25 percent and increases in flavonoid content of more than 250 percent using this genetic mechanism,” said ORNL lead researcher Wellington Muchero. Forage Genetics International, a major supplier of alfalfa seed, has licensed the technology and will evaluate it for commercial use in animal feed.